The Oracle of Love, a handbook for healing, is a poetic reminder of the healing power of love and a beautiful response to the heart looking for guidance. When in doubt of your innate ability to love, or when in need of some comfort or a gentle reminder, open these divine leaves and let them speak to you. Allow the powerful energy of divination and prayer to guide you; help you shift your thinking, ease your pain, wipe your tears, and serve as a gentle balm to the spirit. Each and every page of this oracle reminds us that Love is the tangible and illusive energy that we must never let go of. Throughout these beautiful pages, filled with stunning photography and divinely inspired "Love Blessings," you will find laughter and love, healing and wholeness. Love, just Love! That's all there is, and ever will be. This heart-awakening work was inspired by Maya Tiwari's extraordinary life's journey and birthed from the passion of a heart that finally healed into its fullness of love and everlasting bliss. For the past quarter century while living as a female Vedic monk, I've performed thousands of hours of prayers, chants, meditation, mantras, and blessings. Through this benign grace I was able to achieve great states of awareness, in which I'm continually enfolded in the embrace of the great divinity. I see this divinity in everyone, recognize that everything is God, and have witnessed the awesome miracle of God in myriad ways. 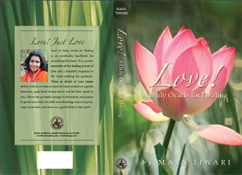 One such miracle is the energy and blessing behind this profound, poetic work: The Oracle of Love. During my recovery from cancer, I was compelled to reach beyond my life's breath to a greater force; a power I had grown familiar with through past experiences. Now, in a stunning course of events that occurred over the past two years, I have found myself recovering from a tragic crime but once again, the Miracle of Love rescued me from what could have been a devastating odyssey. Whatever may be the illness, challenge, difficulty, disappointment, or crisis in your life, hold on to this implacable truth: You are loved. And you have the power to perpetually refill that love from within. Even when the inner light grows bright, or dim; or love is fulfilled, or betrayed; or when we gain or lose a loved one, love can never be taken away from you. Because you are Love! I am Love! Every tissue, cell, and memory of our being is composed of the cosmically divine material of Love, just Love. How well we know this certainty about ourselves is the degree to which we will use the divinations in these leaves to heal and transform everything else in our lives.